When the Pink Star—a 59.60-carat, oval, internally flawless diamond—fetched $71.2 million (including buyers premium) at Sotheby’s Hong Kong on Apr. 4, it was touted by the auction house as setting a “New World Auction Record for Any Diamond or Jewel.” That amount was considerably less, however, than the aborted $83-million Sotheby’s sale of that the same gem in 2013—a transaction never consummated “because the buyer…never paid and the auction house had to reclaim the stone,” as reported by Bloomberg‘s Corinne Gretler. Now it seems that this year’s more modest “Pink Star” record is still not a done deal: This sale, again, has yet to be consummated. The specific time limit to “collect the money from the [April] buyer” is disclosed in Sotheby’s latest Form 10-Q quarterly report, filed yesterday with the SEC: It reveals that “the purchaser of the Pink Diamond, who is one of the largest jewelry retailers in the world [identified in the sale’s press release as Chow Tai Fook], is legally obligated to pay the purchase price by no later than Apr. 4, 2018 [emphasis added].” The previous quarter’s 10-Q, dated May 10, did not mention the possibility of a year-long payment delay. Before an auction, purchasers sometimes arrange for “extended payment plans,” as described in the catalogue’s “Conditions of Sale.” When contacted by me, Sotheby’s would not say whether delayed payment had been prearranged for Pink Star. Also involved in this transaction was Sotheby’s $34.2-million sale of an “undivided legal and beneficial 50% ownership interest in the Pink Diamond,” which occurred during the second quarter of 2016, as reported in the latest 10-Q. Directly after the April sale, the gem was renamed the “CTF Pink Star,” in honor of the late father of the founder and chairman of Chow Tai Fook, whose current chairman, Henry Cheng Kar-Shun, placed the winning telephone bid, according to Sotheby’s. 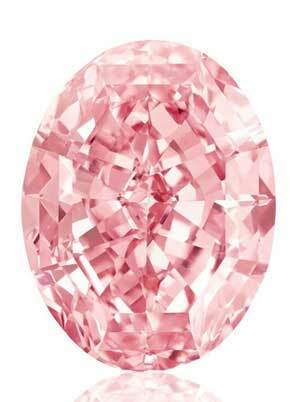 When payment is collected and the related revenue is recognized in our financial statements, the sale of the Pink Diamond will result in a gain of approximately $0.5 million [emphasis added], after taking into account the associated cost of inventory sales of $70.7 million, which includes amounts due to our partner and other costs related to the sale. The auction firm had lined up an irrevocable bidder who promised to bid on the Pink Diamond, “at a value that ensure[d] that the lot [would] sell.” Under the terms of the agreement with Sotheby’s, the irrevocable bidder was to be “compensated based on the final hammer price in the event he or she [was] not the successful bidder.” If he/she was the successful bidder, the irrevocable bidder stood to “receive a fixed fee,” as explained in the catalogue. During the conference call, Sotheby’s CEO Tad Smith mentioned that “our book of guarantees and irrevocable bids performed very well” in this year’s second quarter. Art-market and stock-market wonks can hear a replay of the entire conference call, here. The stock market apparently didn’t like what it heard. Sotheby’s share price, which has risen substantially this year, dropped yesterday from 53.7 at the opening to 51.15 at the close, on high volume. As of 11:09 this morning, it stood at 51.05.